What is a professional and how do we define it? A professional is defined as “the conduct, aims, or qualities that characterize or mark a profession or a professional person” (Merriam-Webster, n. d.). There are many references which describe a profession/professional, and how it is perceived. For many in health care, a professional is reflected by a regulatory college or professional origination that sets requirements and ethical standards. However, is a profession solely based on regulatory standards, or are there other factors which apply? Paramedic professional identity plays a large role in how we see ourselves as professionals. It requires the ability to practise with honesty, and integrity, the application of a recognized body of knowledge reflective of evidence based practice, the skills to apply said knowledge in such a way that demonstrates good practice, and whose behaviour is considered a role model for others. However, most importantly, accountability. Not just to the profession and to our peers, but to our patients. In short, the application of ‘professional’ judgement in our daily practice. Good practice, accountability, and professional judgement are all important factors, but how do we achieve them? Paramedicine as a profession is in its infancy compared to other health professions such as nursing. Historically, many health professions have expanded their role as professionals through the development of education. Nursing, for example, has education and training validated by a professional licensure, with a code of ethics and established standards (Cardillo, 2013). Does paramedicine not have specialized education and training validated by either a licensure or a certification process, with identified ethical standards? Nursing has its own body of research, and works autonomously within a scope of practice (Cardillo, 2013). Has paramedicine not developed its own evidence based practice, which has an identified focus with the application of prehospital care? And with this evidence, has it not allowed us to become more autonomous in our application of care with the use of such tools as medical directives and/or standing orders? Nurses also use judgement, cognitive and critical thinking skills in the application of patient care plans (Cardillo, 2013). Judgement, cognitive and critical thinking is the foundation of paramedic practice and how paramedics apply working assessment skills in the application of patient care. To break down the construct of a professional is an all-encompassing process. It is more a way of being, which is reflective of attitudes, values, and behaviours (Morrow et al., 2011). Many, in health professions, consider being a professional as a reflection of competency in skills and knowledge, application of good practice, realizing limitations, or as I like to refer to, ‘knowing what you don’t know’, and to treat others how you would want to be treated. In short, ‘doing the job’ Being a professional is as much personal as it is ‘professional’ It is as much the reflection of one’s own moral and ethical compass, core values and beliefs, as it is an application of care (Morrow et al., 2011). However, as much as we could discuss the holistic construct of a professional at length, it is just as important to identify a foundational educational structure that reflects a body of knowledge, standards, requirements, ethics, technological requirements and how paramedics have extended their roles within the health care community. Paramedic education has undergone a significant transformation since the 1960s, when all that was required was a first aid certificate, a driver’s license and a strong back. In Ontario, paramedic education expanded into a more formal process in the early 1970s with the foundations of casualty care, and the Emergency Health Services (EHS), now known as the Ministry of Health and Long-Term Care (MOHLTC), certification, Causality Care Attendant (CCA). As we moved toward the end of the 1970s and into the 1980s, this education was expanded and moved to the college system, with graduates requiring a pre-employment post-secondary college certificate, and the successful completion of a regulatory exam, the EMCA (Emergency Medical Care Attendant). Today, we have an educational system that is supported by professional post-secondary institutions with diploma, post graduate certificate, and degree granting status. Further development of the profession has come from the use of informatics through research, evidence based practice, quality improvement, patient centered care and the continued development of education toward a degree as entry to practice. Furthermore, various provinces have actively lobbied for, and achieved, a college of paramedicine with self-regulation, oversight, licensure and certification. These aspects, along with all-encompassing holistic development, describe an ever-evolving process in professional growth. Students entering the paramedic educational system today do so with diverse educational backgrounds. Many already have degrees in various areas of science, health and education, therefore bringing an expansive body of knowledge that only enhances us as a profession. Paramedic practice has advanced over the years, from non-invasive application of care, to more complex paramedic practice (O’Meara, 2009). Today, paramedicine is at a crossroads, not just in health care, but public health and public safety. This professional intersection is identified through accreditation, preceptorship, certification standards, professional development through continuing education, professional organizations and the structure of a code of ethics. All these aspects have given paramedics a very unique body of knowledge. Link these concepts with judgement, problem-solving skills, cognitive, and critical thinking, and we have the foundation for what is considered a professional (O’Meara, 2009). For those of us who have had the privilege to see our profession grow, and work with those early pioneers who only had first aid, a driver’s licence and strong back, to the beginnings of what we can consider the initiation of ambulance as a profession through the CCA certification process, our profession has come a long way. Looking back on my 32 years, and seeing how our profession has progressed, has been exhilarating. In Ontario, the profession has had great advancements since those early days, with the first Toronto Paramedic Service (TPS) ACPs in 1984, to the expansion of ACPs across the province of Ontario in 1994, the continued advancement of the profession through the introduction of defibrillation and symptom relief medications in 1995 (OPA, 2015), to the development of special teams, such as the TPS tactical medics in 1996, and land Critical Care Paramedics in 1998 (OPA, 2015). Paramedicine has shown advances through the use of education and evidence based practice, which has developed a solidified body of knowledge, and one that is still growing. All of which, reflect a linear process of advancement. If we compare this progression with other health care professions, such as nursing, we can see they followed a similar path to achieve their professional status. Professionalism can encompass a number of different attributes, such as knowledge, competency, honesty, integrity, accountability, self-regulation, education, and emotional intelligence. All of these constructs reflect an image, in short, professionals look and act the part. That look for paramedicine, at least in part, is the polished uniformity of dress, which gives an air of confidence to our patients. As I said, the uniform gets you in the door, but you only get one chance for a first impression. How you present yourself and your ability to interact with others is all part of the process. Over the last 40 plus years we have shown that paramedics are professionals, and as a profession we have made great strides throughout Canada. What will the next 40 years bring, and what will the paramedics starting the profession today be able to look back on? What great changes will be coming in the future to advance us as a profession, and what will occur in pre-hospital care that change patient outcomes prior to admission to the hospital emergency department. Based on the last 40 plus years, what a “PROFESSION” it will be! 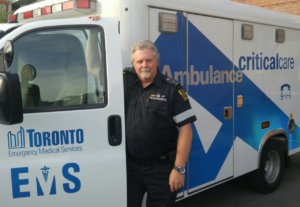 Dr. F (Kelly) Sheppard has over 30 years’ experience in EMS, and is one of the original Critical Care Paramedics with the Toronto Paramedic Service. Kelly spent 22 years as the coordinator of the Loyalist College Paramedic Program, and currently is an inspector with the Ontario Ministry of Health Ambulance Service Review Team. Kelly holds a Bachelor of Health Science in Pre-hospital Care from Charles Sturt University, a Masters of Education from Athabasca University and a Doctorate in Health Science from AT Still University. Cardillo, D. (2013, March 4). Is nursing a profession or a job? American Nurse Today. Journal of American Nurses Association. https://www.americannursetoday.com/blog/is-nursing-a-profession-or-a-job/. O’Meara, P. (2009). Paramedics marching toward professionalism. Australasian Journal of Paramedicine, 7(1), 1-5.